Smile! This blog is about joy in living and nutrition. From insights for motivation to tips and recipes for health. Helping to make the world and people more loving. Now-a-days Americans and the world are suffering from a multitude of chronic health issues and diseases. It has been scientifically proven that many conditions, such as high blood pressure and cholesterol, chronic sinuses, fatigue and so many others can be reversed by eating a healthy diet. Dr. Stephan Rechtschaffen, MD, cofounder of Omega Institute, believes 60-70% of people suffer from food allergies, which can develop at any time. a simple way to determine if you have a food sensitivity. Experimenting with your diet will help you connect more with yourself and your health. An elimination diet for you to find out if you are allergic to any foods requires that you forego eating a particular food(s) for a certain amount of time to determine how the food is affecting you. 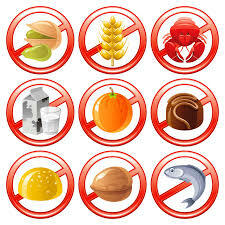 The most common allergenics foods are Milk, Citrus, Wheat, Eggs and Soy. Avoid this foods for 7 days and see how your body feels. You will feel lousy or even worse during Days 1-4 because your body is going through withdrawals; Days 5-7 you will feel better. On day 8 you can introduce milk again for example if you are sensitive to that food, your symptoms will come back automatically. On Day 9 replace the milk with citrus for the day; on Day 10 replace citrus with soy for the day; on Day 11 replace soy with eggs for the day. Try it with as many foods you want to try and take your doubts of about what you might be allergic to.